Recent OE/Original Equipment calipers have come a long way in terms of both performance and design. Far more rigid than their predecessors, the current generations from Brembo, Nissin, Sumitomo, Tokico and others are ultra-stiff and relatively lightweight designs which have been instrumental in elevating stock braking performance to new levels. But, unfortunately, theyre still using problematic Aluminum pistons  lightweight, yes, but also highly conductive in providing a huge heat path straight into the hydraulics. 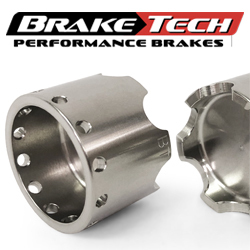 BrakeTech has now addressed this with these precision engineered ventilated Stainless Steel pistons of proprietary material - which feature a 12 ventilation holes and a unique castellated reverse chamber for increased fluid capacity - that all but eliminate those shortcomings. Note: We recommend replacing piston seals when installing. !braking, brakes, vented, gsxr600, gsxr750, gsxr1000, gsxr, 600, 750, 1000, yzfr1, r1, yzfr6, r6, yzfr3, r3, zx6r, zx10r, zx10rr, zx-10rr, 04, 05, 06, 07, 08, 09, 10, 11, 12, 13, 14, 15, 16, 17, 18, 19, 20, 2004, 2005, 2006, 2007, 2008, 2009, 2010, 2011, 2012, 2013, 2014, 2015, 20116, 2017, 2018, 2019, 2020!